The most famous tilting tower in the world might be the Leaning Tower of Pisa. The 8-storey tower has been tipping now for 840 years and thousands have flocked to see its faulty angle ever since, but do you know about the other leaning tower of Italy? 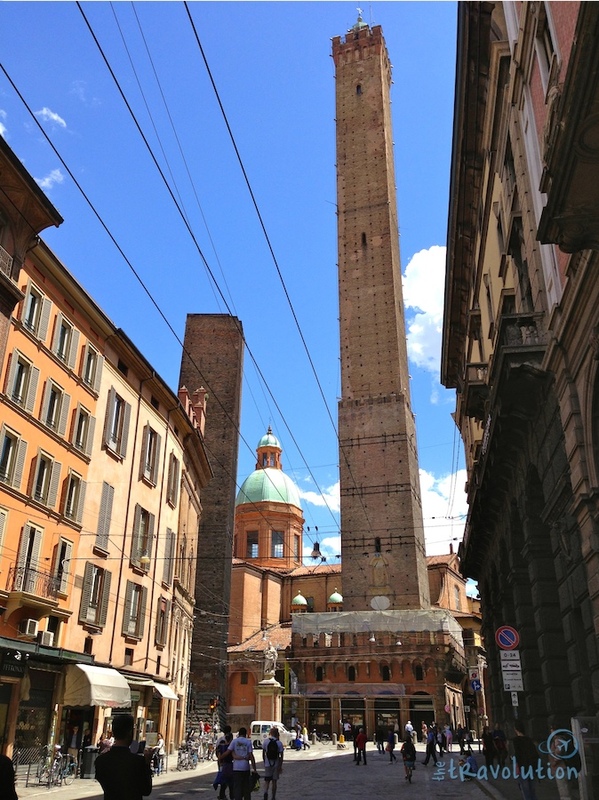 Rivalling Pisa’s tower are the leaning towers of Bologna. The Two Towers, or Due Torri, were built in the 12th century and they’ve been teetering ever since. Although the Garisenda Tower is the shorter of the two, it never used to be. In the 14th century, the top of it was cut off to keep it safe for passersby but its steep lean makes it too dangerous to climb. The Asinelli Tower slants at just 4 degrees less than the Leaning Tower of Pisa. It stands at 97 metres high making it the tallest tower in Italy with the best bird’s eye view of the red city. A tall, old, gravity-defying structure with a view? Challenge accepted! I decided to make my way up! While Pisa’s tower costs €18 to climb, needs a reservation a month in advance, and a has queue of tourists way too long for my patience, the Asinelli Tower is much more traveller-friendly. Only €3, no booking, and rarely a line up! 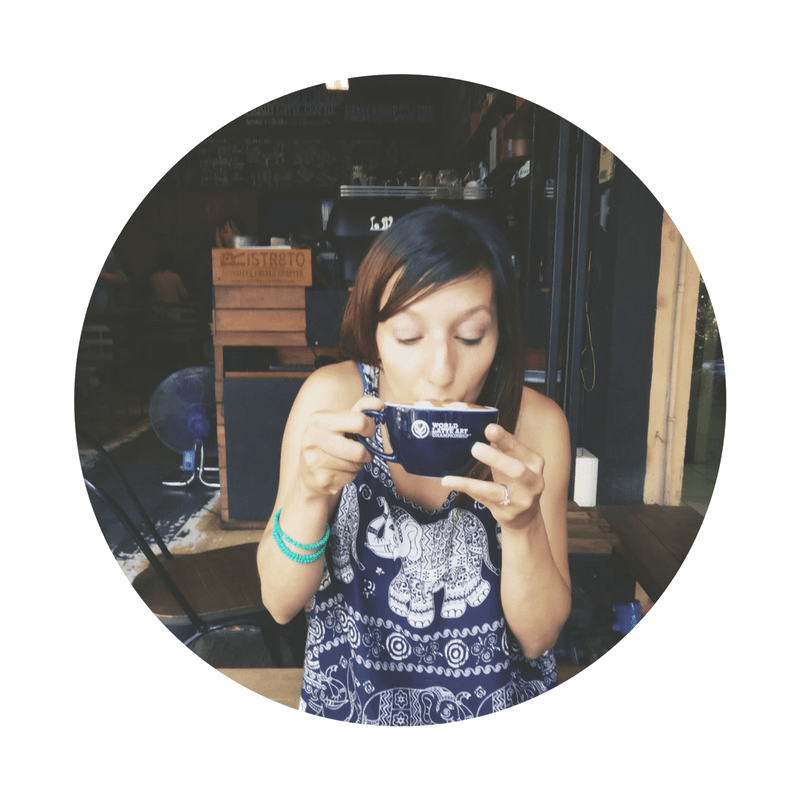 The perks did have a down side – I was about to take on 498 teensy up the spiralling stairwell and 15 minutes of continual dizziness! One climber behind me attempted to count each step! (Either he thought he was getting ripped off by some false marketing promise or he justed wanted to make sure he got his 3 euros worth?) Personally, I had to stop every few minutes just to catch my own breath and keep my head from spinning! 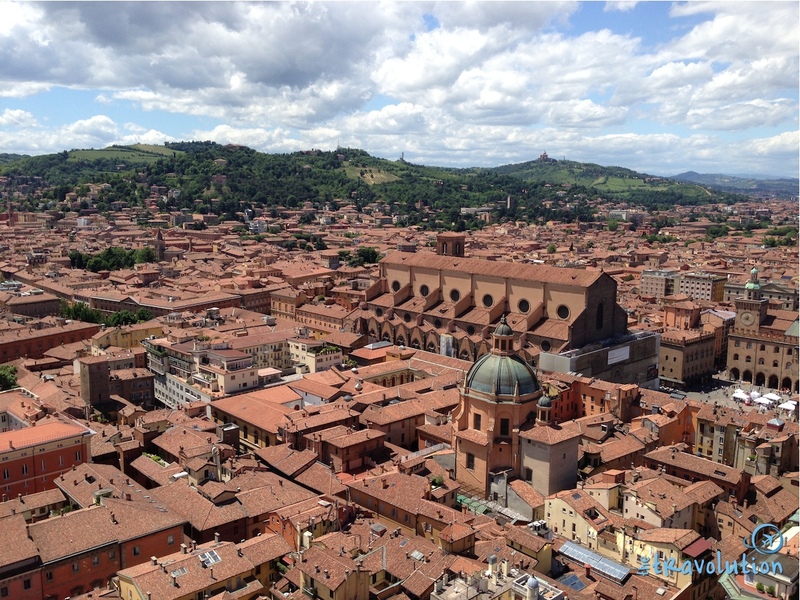 Despite it all, once you do get to the top, the panoramic view overlooking the city of Bologna is absolutely stunning and well worth the hard work! 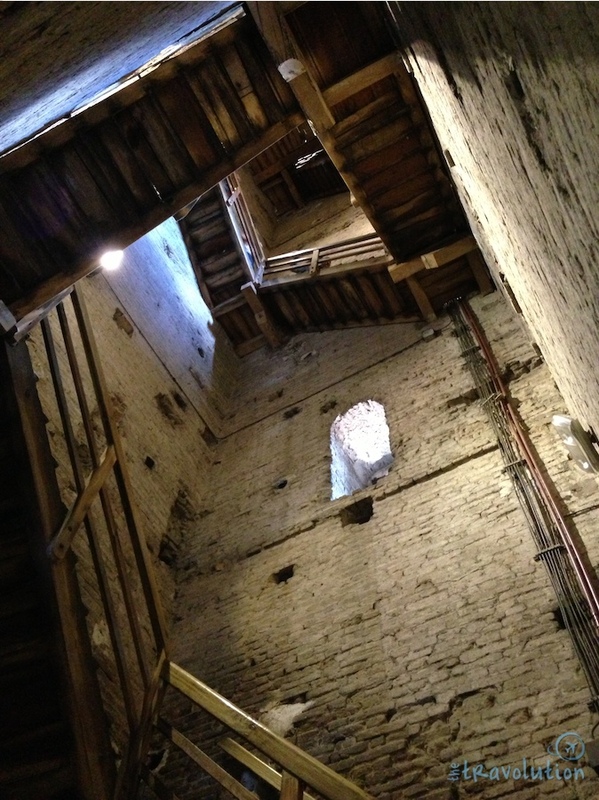 History says Bologna’s towers served as a defense against potential threat at the time. Even in the most recent Second World War these towers helped the military keep an eye out for bomb strikes. Like many structures in Italy, Bologna’s towers were also a powerful symbol by the city’s two richest families who wanted to showcase their wealth and prestige. The wealthiest people always built themselves impressive structures and competed with each other for who could build the tallest tower. 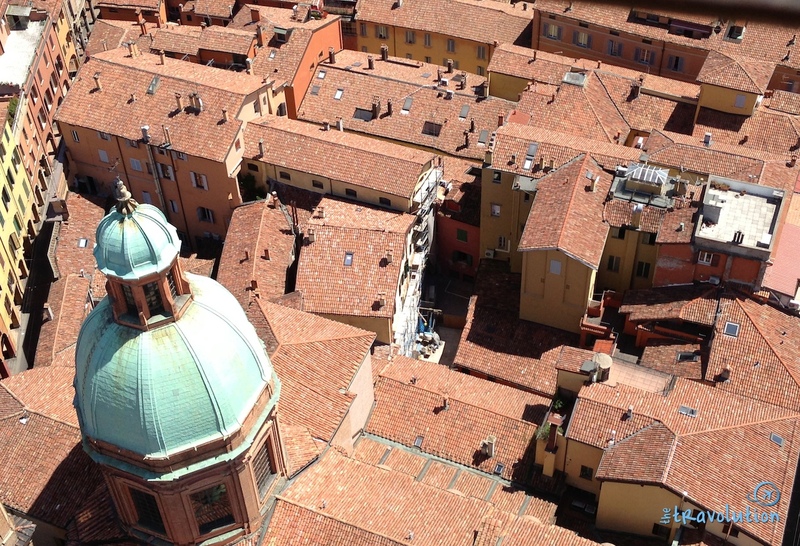 By the 13th century, competition was fierce – about 180 towers popped up all over Bologna. Standing more than 300 feet above gazing over the horizon, I tried to imagine a city in the Middle Ages looking like a crowded Monopoly board. I could live in one of those red houses! 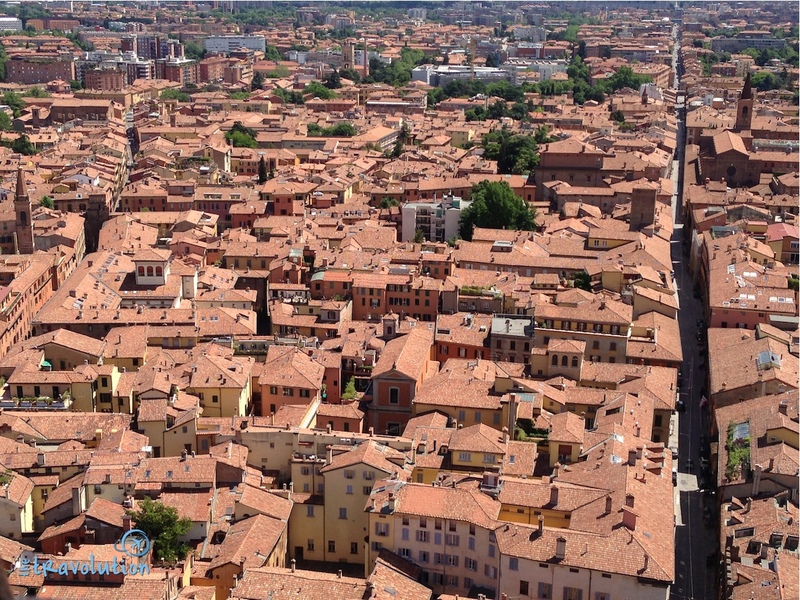 Today, less than 20 towers still exist in Bologna. While some had collapsed, most towers were demolished for safety reasons. The last one was taken down in 1917 and the Asinelli is the only one you can ascend for a view. You’re a student. 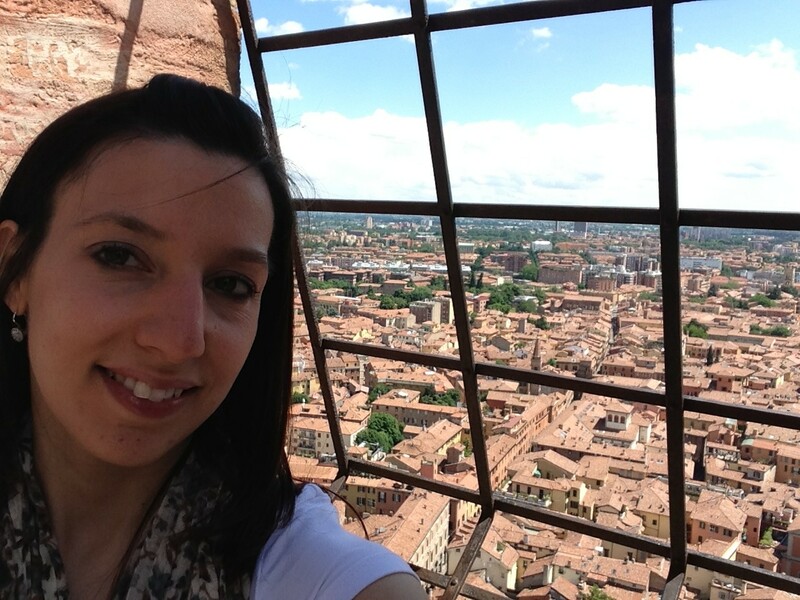 Although Bologna is a university town, students (and superstition) say if you climb the tower you’ll never graduate. Have bad shoes. The steps are steep, wooden, and slippery. Grab shoes with good grip. 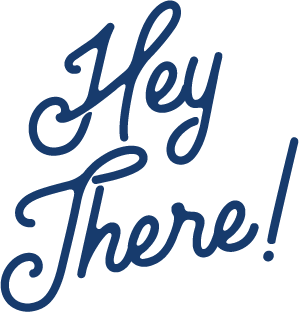 You’ll definitely feel the tilt the higher you get. 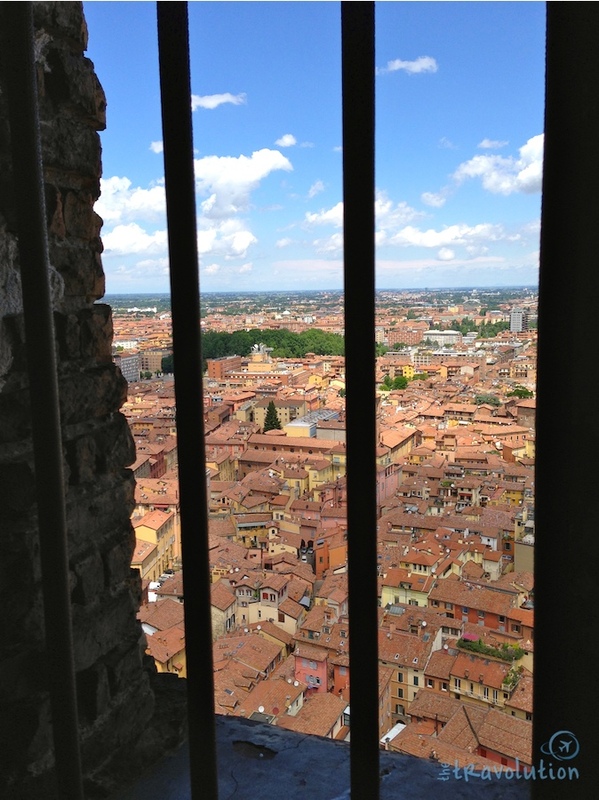 Tip: If you get lost weaving through Bologna’s winding roads, use the towers as a meeting point or to orient yourself. Thank you to Emilia Romagna Tourism for hosting me during the BlogVille campaign. Although I was a guest, all views and opinions expressed are my own. Me too! It reminded me of the beautiful red rooftops over Florence! Wow who knew there was another leaning tower? Yet another reason to explore the region. I was pleasantly surprised too! It’s definitely one of those little known facts. The stairs are a tad tiny. You have to make way for those climbing down as you’re going up. 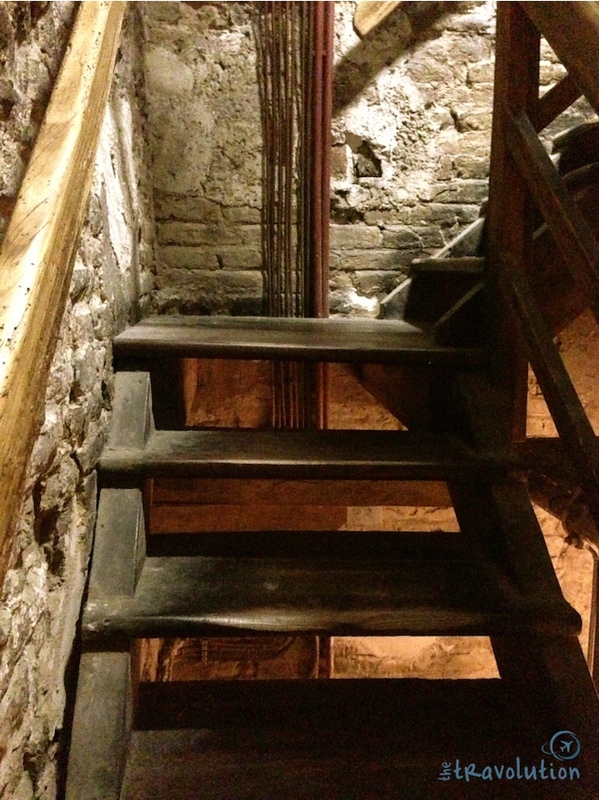 But I thought it was neat – it adds character to a building a gazillion times older than me! In terms of the weight, you don’t have to worry about it teeter tottering hehe!